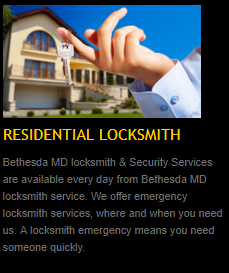 ‘Bethesda MD locksmith service’ is your local locksmith in Bethesda MD, Chevy Chase MD and Rockville MD. 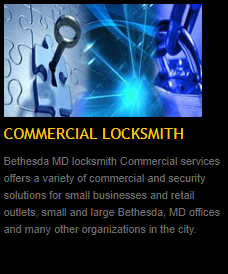 From vehicle lockout to ignition switch installation, we are here to serve you! 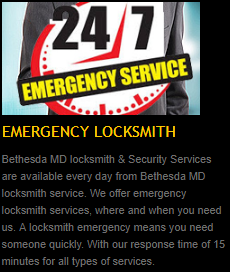 If you are looking for a fast, reliable & a professional locksmith solution, give us a call at 240-252-7501. » And we offer flat rates, with no-hidden fees! 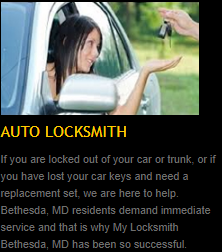 » Car services – lockouts, ignition issues, key duplication and more..
» Approximate response time of 15 minutes in most cases. » Interior, wood/glass/metal or French doors, all are custom made to fit your needs and requirements. » Safes of all kinds are sold in our stores, ranging from floor and wall safes to fire proof and sentry. Our services also include the delivery and installation.